In this post, we will discuss the difference between Poplin and Cambric fabrics in terms of their construction, end use, and more. In Poplin, a high warp density is used compared to the weft. For an example, fabric EPI and PPI are like 122x64, 136x72. Fabric with crosswise ribs that typically gives a corded surface. Cambric is a square structure fabric.Like a construction of 60x60, 76x76. Finer yarns are used in cambric compared to Poplin. Lightweight but very dense fabric, shiny surface on one side. Poplin, strong fabric produced by the rib variation of the plain weave and characterized by fine, closely spaced, crosswise ribs. It is made with heavier filling yarns and a greater number of warp yarns and is similar to broadcloth, which has even finer, more closely spaced ribs. Cambric, lightweight, closely woven, plain cotton cloth first made in Cambrai, France, and originally a fine linen fabric. 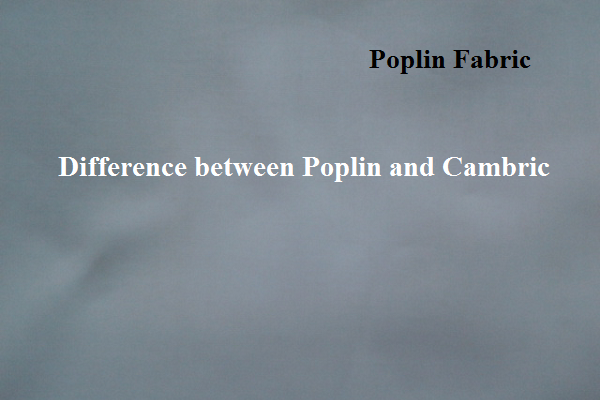 Poplin: It is used for shirts, pajamas, women’s wear, and sportswear and also as a decorative fabric. Cambric: Cambric is ideal for handkerchiefs, children’s dresses, slips, underwear, and nightgowns. Learn about the fabrics like poplin and cambric, their end use and construction details.